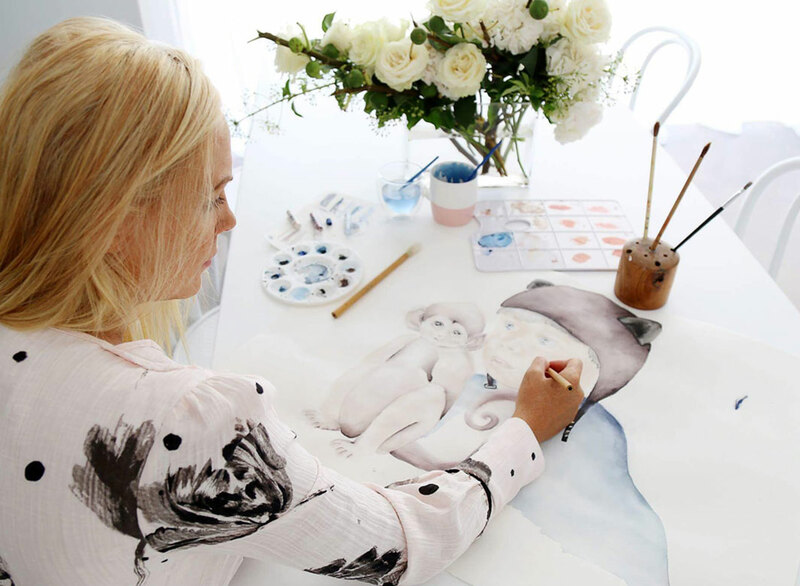 Artist and mother of two, Summer Daniels, gives us a tour of her beautiful Queensland family home and shares how she balances life as a full-time creative whilst raising two daughters under two. I love to paint and I love being a mummy. My inspiration for Little Rae Prints really came from the birth of my first daughter and wanting her world to be magical for as long as possible. 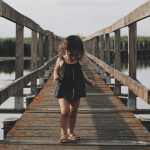 It is really about creating that space between reality and dreams – encouraging the magic that comes to children so easily, and letting them be little. I hope my work enables mothers to create affordable spaces for their children that feel luxurious, beautiful, and in turn, give some degree of extra comfort, in the late hours, the early hours and the in-between hours spent tending to their little ones. What attracted you to watercolouring? There is something very calming about watching water and paint mix on paper, it’s a form of therapy and it’s fun to manipulate the picture. I love to create that magical feel. I often say I like my paintings to ‘glow’, for this I use pastels – they give my art life. 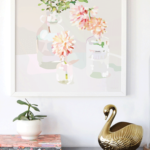 Do you hang your artwork in your home? Does it inspire the space when you style the rooms? Absolutely, my girls’ rooms are covered in my art! 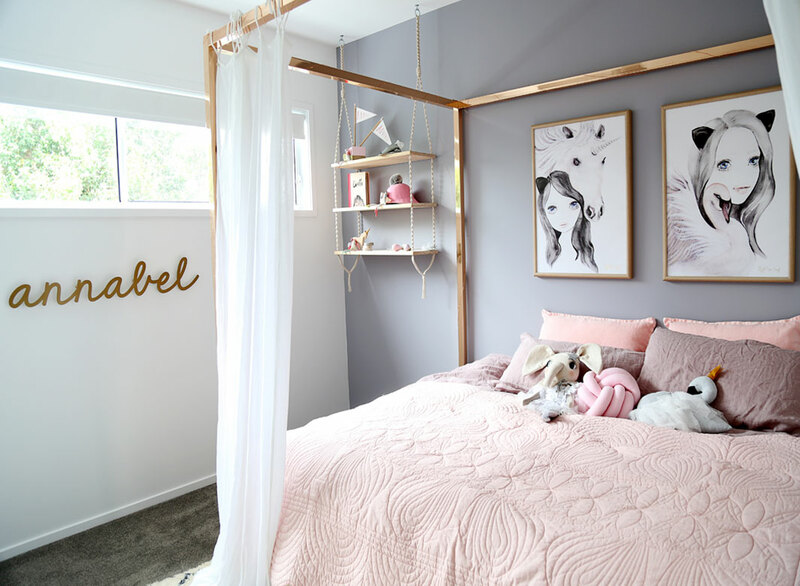 I worked with Belinda Kurtz from Petite Interior Co on a brief for Annabel’s room that was completely inspired and designed around my ‘Elody’ and ‘Odette’ prints. Everly’s nursery is currently doubling as a playroom so it is colourful and fun and covered in six A3 prints on one wall. She sleeps in a bassinet beside my bed and will do so until at least six months. So for the moment we use her space as a breastfeeding friendly play retreat that helps to keep my two-year-old entertained. What has been the most exciting place to see your work featured? I don’t think I will ever tire of the thrill I feel when I see my art in other people’s homes. Especially when they have gone to the trouble to share it with us via social media, email, etc. Being able to be part of creating magic for little ones all over the world, there is something super special about that. Can you tell us about your family home? It was designed with Immakulate Homes to make the most of the Australian indoor/outdoor living with low maintenance in mind. It is modern, open plan living. Our kitchen flows into our BBQ and outdoor area which looks out onto the backyard and pool. We wanted to be able to see the kids playing while we cook dinner. It has a great look, feel and from a practicality perspective – it’s perfect. The exterior is very modern, white, square set with feature timber. We are just about to plant a mature Jacaranda out the front which I intend to hang a tyre swing from. Climbing Jasmine and white Bougainvillea are slowly softening our white fences around the pool area to bring a ‘Hamptons’ feel to the backyard. The interior style is minimalist and classic, with white walls and a black kitchen with marble benchtops and splashbacks. We went with a very fine grain polished concrete floor. Our stairwell is also white – I love it, as it adds light to what would have otherwise been quite a dark space. All bedrooms are upstairs with a separate play/lounge area that houses the majority of toys that would otherwise be in the girls’ bedrooms. Definitely my girls’ rooms – I think it’s because so much love has been poured into creating them. They both incorporate Little Rae Prints as the statement pieces. 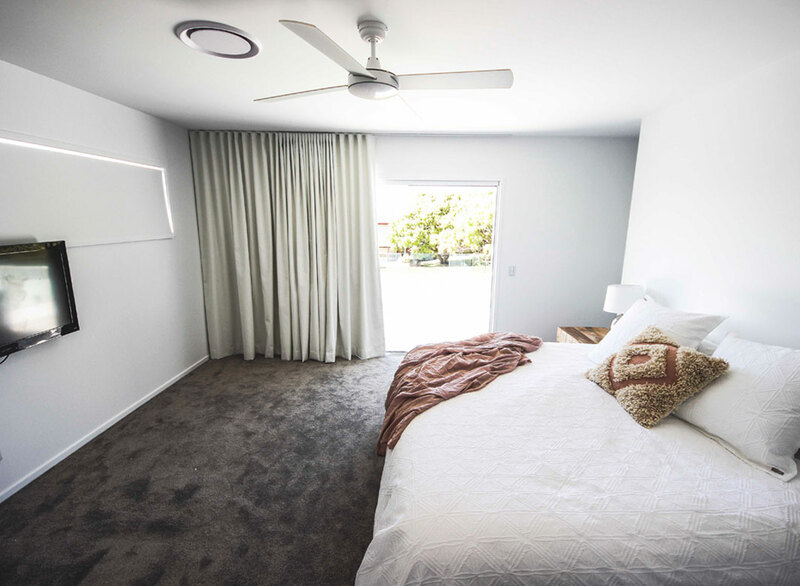 It was important for us to create rooms that give the feeling of comfort and magic. Favourite pieces in your home? And the girls’ favourite pieces in their rooms? My favourite piece is my dining room table. I had it custom made to fit our space with a super flat, smooth top which is perfect for painting. 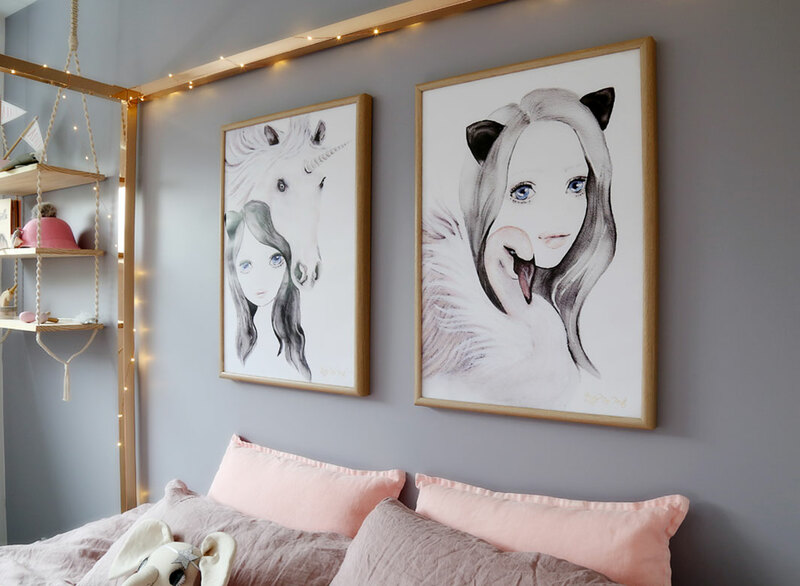 In Annabel’s room, we hung the huge statement Little Rae Prints that feature a unicorn and swan combined with lots of twinkling lights above her bed. These elements of ‘WOW’ really made her fall in love with the space. Everly’s space is all about being light and bright with fun, simple activities and toys to entertain Annabel when Everly needs my attention. I have different prints on every wall and each provides their own magical element. Your top 5 styling tips for a family home? 1. Create storage – clutter destroys the calm. 2. Invest in long term pieces you love. 3. Create a warm, soft, safe room with a touch of magic for children – a space they love spending time in. 4. Use art on the walls that makes you feel good. 5. Functionality – go with what makes your ‘everyday’ easier. We all love spending time here – we designed and furnished it to make us feel good. If something wasn’t working, it went. I spend so much time in this space, so I wanted to make sure we all loved it. I work from home primarily in my own studio and office. My husband David works month on and off, so being able to catch up on things in the dark of the night while he is away is crucial for me. It allows me to achieve the level of productivity I do without compromising how much of myself I give to my children. How do you juggle and create balance? Establishing set hours have been key to maintaining balance in my home, allowing me to give my children 100% of myself as a mum without the distraction of work. Annabel is in daycare two days per week. However, as I have a very young baby, my work right now revolves around her ever -changing sleep routine and feeding demands. Because of the unpredictability of having a young family, it is also important for me to have a degree of flexibility to ensure I’m able to be productive (cue late nights/early mornings). I also have a fantastic team in place that helps me manage the day to day aspects of Little Rae Prints, allowing me to pursue the creative side. What are your top 5 key ‘must-have-can’t-live-without’ items? 1. iPhone – cliché but how did we survive without them?! 3. A fab red lipstick – never fails to elevate my mood. 4. My beloved, ‘hold everything/can never find anything’ handbag. 5. And of course…. art supplies, to feed my ‘me’. What has surprised you most about becoming a mum? The next level of absolute selfless love that enables you to pull on some deep reserve of energy you didn’t realise you had. Because in the most challenging times, it doesn’t matter how much you give, how little you sleep, how broken you think you are, somehow, you’ve always got more. 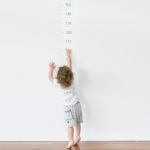 What values do you wish to instil in your children? Kindness and humour are absolutely paramount to myself and my husband. We want our children to walk their paths with light feet and happy hearts. I see my job as making sure they know they are fiercely loved and deeply valuable. I hope from this, they will have the confidence to go consciously into circumstances that challenge what they think they know, with open hearts and open minds against the natural instinct to squeeze their eyes shut and stick their fingers in their ears. Summer Daniels, 32, lives in Queensland with her husband David and two daughters Annabel, 24 months, and Everly, 4 months. Summer is an artist and founder of Little Rae Prints where she sells her magical watercolour prints. You can also follow and find more of Summer’s beautiful prints via her website, Facebook and Instagram.